The Ricoh MP C5504 is the most powerful of the Ricoh A3 line which we tend to sell. It’s inner working are more or less the same as the Ricoh MP C3004 and MP C4504 but it’s print speed on 55 ppm is 25 resp. 10 pages per minute faster. All the other same great connectivity features apply. At the heart of the Ricoh MP C5504 is a powerful, easy to use “touch and swipe” colour Smart Operation Panel that makes mobile and flexible working simple. This all amounts to a more productive workflow for your team. What appears on this panel can be tailored to the individual preferences of users, with immediate access to the most commonly used print, copy and scan functions through one-touch icons. Moving forward, file sharing platforms such as Dropbox, Box and individual case management systems can be seamlessly linked. Ricoh MP C5504 features Ricoh’s new 10.1” Smart Operation Panel and is print, copy (45ppm) and scan enabled. Fax is an option. This SP version is supplied with an Automatic Reverse Document Feeder (ARDF) via which 100 originals can be fed in a single batch and scanned at a speed of 80 images per minute. Other functional options include PostScript and Kopikat Shareflow OCR scanning. The Ricoh MP C5504 uses Ricoh’s GWNX controller, with its superfast 1.33GHz Intel processor to manage the workflow. To save time, a Human Detection Sensor wakes the MFP instantly from sleep mode – it takes less than 1 second – and the Smart Operation Panel lights up when touched, allowing the user to select applications and settings. The new Intuitive User Interface simplifies operation and Ricoh’s Smart Device Connector app improves mobility by enabling users to interact with the MFP using their smart phones and tablets. The MFPs also support use of optional workflow solutions, such as Ricoh’s StreamLine NX and GlobalScan NX. 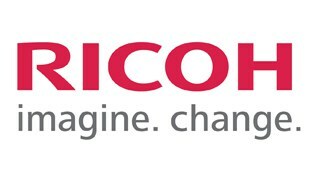 The greatest assets to a business are those which perform consistently all year round and the Ricoh A3 range is no different. Running quietly in the background, it comfortably handles all your office needs; printing and copying in colour, organizing document sets, scanning and distributing information and processing fax messages. The advanced MFPs share a common platform and with a range that includes 30, 35, 45, 55 and 60ppm models. Each one a workhorse in its own right, the only thing up for discussion is how fast you need to be.